I was an athlete all throughout high school and college. I played lacrosse, a game dependent on running. The faster the better. Now that I’m all retired from sports and stuff, post college, I’ve traded my timed miles and running shoes for slower forms of exercise. Walking is chief among them. Don’t think that walking is only for soccer moms or retired grandparents. Walking is one of my favorite forms of exercise and for many people, it’s better than running. Walking helps reduce your risk of high blood pressure, diabetes and high cholesterol according to the American Heart Association. It has the same health benefits as running, with fewer risks. For example, you’re more likely to turn an ankle running than walking. Walking is easier on the body than running too. Running is a high impact activity. You’re literally pounding your entire body weight on your joints with every step. Combine that with a hard surface like cement or a treadmill and the wear and tear adds up quickly. Runners often get shin splints, knee problems or joint pain after only a few years of consistent running. With walking that impact is significantly lessoned. 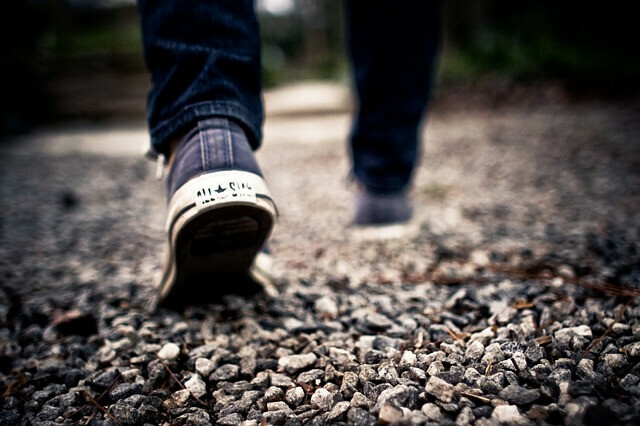 If you carry weights with you, walking is also a fantastic way to burn calories. I like to throw on 2 lb wrist weights and walk around my neighborhood for 40-60 minutes a few times a week. I promise you’ll feel the burn! Walking is much easier to fit into your daily routine than running is too. I try and walk to as many places as possible. I walk to the grocery store, the pharmacy and the coffee shop that I work from occasionally. Walking definitely takes more time than driving or even biking, but take a look at a typical day’s opportunities for walking for me. Doing just a normal day’s activities I can get 60 minutes of walking in, without having to schedule specific work out time. Not only is this healthier for me, it’s also frugal! Walking helps me save on gas and the wear and tear on my car. By walking places I also get a little time to clear my mind and spent some time with myself. My along time doubles as my exercise time. By the time I’m back home, I can go straight into another project and don’t have to worry about finding an hour to work out later. I’ve already done it! Walking is also the perfect entry into the wider world of fitness. Very few people can just get up from the couch and run an 8 minute mile. For those of us who are very out of shape or recovering from an injury, surgery or dealing with something that hinders a more strenuous work out, walking is the perfect thing. It’s a great way to work on your health and reap the benefits of exercise without having to be in perfect shape. It’s free, it’s fun and it’s 100% natural. While something like dead lifts may not come easy to all of us, walking is a very human activity. Our bodies are designed for it. There’s a million ways to start walking. You can switch to the stairs instead of taking the elevator. You can join me and walk to the grocery store. Try a morning or evening walk with friends or family for 30 minutes. 30 minutes every day increases heart health for everyone who does it. You can pop in your headphones and have some time to yourself or you can make the walk a more social thing. You can walk uphill to get some gentle resistance and to maximize your workout too! I personally try to go for an evening walk 3 times a week. I also like to run and do yoga, which I consider my heavy work out days. An hour long evening walk is the perfect supplement to my more intense days. My muscles still get used but they also have a chance to recover. I encourage everyone to look for ways to add more movement to their lives. Walking is the easiest and most accessible exercise out there. How can you fit walking into your daily routine?